Kerrang! magazine conducted an interview with an interview with Duff McKagan (Duff McKagan's Loaded, Velvet Revolver, Guns N' Roses) shortly after his appearance at the Birmingham Guitar Show, which took place February 26-27 at the New Bingley Hall in Birmingham, England. You can now watch the chat below. 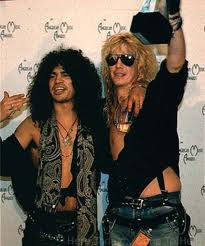 McKagan added, "I think Slash is probably gonna go make another [solo] record [next], so that's cool. That's what it is." Slash told Triple M's Higgo backstage at Melbourne's Soundwave Festival that fans can expect his next solo album to be out as early as December. In between Slash and Higgo bumping heads about their iPhone/Blackberry rivalry and Slash grabbing Higgo's phone to play 'Slayer pinball', the former Guns N' Roses guitarist managed to confirm that his touring band - including Alter Bridge singer Myles Kennedy - would record the whole album.